On February 20, 1995, three days into the official free agency signing period, the expansion Carolina Panthers signed their first two unrestricted veteran free agents. PK John Kasay (pictured at right) and DE Mike Fox were both given five-year contracts and, each in their way signified the priorities of the new club as it built toward both the ’95 NFL season and beyond. The organization was taking immediate steps to set the tone for the defense as well as build effective special teams. “We proved we’re going to aggressively pursue talent, and we’re headed in the right direction by signing Mike and John,” said GM Bill Polian. The contract given to Fox raised some eyebrows ($9 million for the five years) since, while starting every game for the Giants in 1994, he had just 40 tackles (29 solo, 11 assists) and one sack. However, the Panthers were impressed with his toughness, intensity, durability, and 6’6” height. He had also been moved inside to tackle after playing four seasons as a defensive end, and the Panthers moved him back to the outside in their 3-4 alignment. John Kasay had a strong leg and a 78.1 percent success rate on his field goals over the course of four years with Seattle. The concern there was that he had been playing his home games in a domed stadium and would not have that luxury in Carolina (Clemson University’s Memorial Stadium in ’95 and Ericsson Stadium, which later became Bank of America Stadium, thereafter). His five-year deal was for $4.3 million. The Fox signing proved to be in line with other veteran defensive acquisitions that the new team made, including linebackers Sam Mills, Darion Conner, and Lamar Lathon; CB Tim McKyer; and SS Bubba McDowell. Likewise, Kasay was joined by veteran punter Tommy Barnhardt and kick returner Randy Baldwin. In all, Carolina signed 17 veteran free agents, taking advantage of plenty of salary cap space, which was more than any other NFL club. Having failed to lure Joe Gibbs out of retirement, the Panthers made Dom Capers, who had been the defensive coordinator for the Steelers the previous three seasons, the club’s first head coach (and were penalized for violating the NFL’s anti-tampering rules as a result). “We looked to build a defense, then a kicking game, then an offense,” explained Capers regarding the new club’s signing strategy. The Panthers got off to the slow start typical of first-year teams, losing their first five games, but then reeled off four consecutive wins that included a stunning upset of the reigning NFL Champion 49ers. The ultimate record of 7-9 was the best for a modern NFL expansion team and set the stage for a division title and postseason run in 1996. While overshadowed on the defense by the outstanding performance of the 36-year-old Sam Mills, Fox played well. In addition to 4.5 sacks, he was credited with a club-best 28 quarterback hurries and 10 batted passes along with 57 tackles. Kasay alleviated concerns about his ability to kick consistently outdoors by ranking fourth in the NFC in field goals - he was good on 26 of 33 attempts, a solid 78.8 percent. Fox (pictured below) and Kasay were important cogs in Carolina’s 12-4 campaign in ’96 that resulted in a Division playoff win over Dallas and finally ended against the Packers in the NFC Championship game. Utilizing the “zone blitz” scheme that Capers had developed at Pittsburgh, the linebacking corps of Mills, Lathon, and Kevin Greene justifiably received accolades as the backbone of the defense, while Fox’s ability to occupy blockers up front helped to present opportunities for the outside linebackers to rush the passer (Greene had 14.5 sacks and Lathon was right behind with 13.5). The fine defensive play took pressure off of the conservative offense, guided by second-year QB Kerry Collins, to good effect. Meanwhile, Kasay had a Pro Bowl year, connecting on a then-record 37 of his 45 field goal attempts (82.2 %) and scoring 145 points. 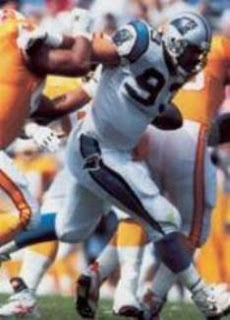 The high-flying Panthers, who had dramatically exceeded expectations in their first two seasons, fell to earth in 1997. Fox was a part of the problem as the defense that had fueled the ascent now led the slide to a 7-9 tally. The loss of Greene due to a contract dispute was the biggest issue, to be sure, and Lathon’s performance dropped off significantly as a result. Fox suffered injuries to both shoulders and appeared in just 11 games. Likewise, problems on the offensive side of the ball caused Kasay to have far fewer field goal opportunities. While hitting on a healthy 84.6 percent of his three-point tries, he attempted only 26 (and was successful on 22) in comparison to the 45 of the year before. Fox was a reserve in 1998, with the team having added free agent DE Sean Gilbert plus rookie DE Jason Peter. It was a difficult year for the club in general, with the record falling to 4-12 amid turmoil and ending up with the departure of Capers. It was the last season for Fox also, who had been such an important part of the defense in the first two overachieving seasons. Kasay lasted with the Panthers far longer. He remained with the club until 2010 and was part of the NFC Championship squad of 2003. One of the first players signed, he ended up being the last of the original Panthers to play for the team. While he missed time due to a couple of significant leg injuries along the way (most notably in 2002, when he was limited to just two games), over the course of 15 years in Carolina he kicked 351 field goals out of 424 attempts (82.8 %) and 429 extra points (missing a total of nine). Along with his 1482 points, he set significant career standards in those categories for the young franchise.